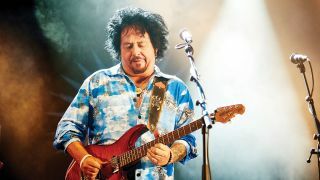 Jet-setting with Ringo and producing Spinal Tap are all in a day’s work for Toto’s main man Steve Lukather. “In sixth grade I had a band called The Blueberry Waterfall. I had borrowed a guy’s Fender Jaguar and Boss Tone Fuzz, which you plugged straight into a Blackface Twin. It was a little power trio - we were actually pretty good for our age. “Raw ginger, sparkling water, Throat Coat tea, organic lemons and some non-alcoholic beer for after show. I stopped all the nonsense many years ago now. If someone sees me with what looks like a beer, it’s always zero per cent. The internet… they say I wear a wig, too. I offer a million bucks to anyone that can get this off my head. And who would buy a wig like my hair? “Don’t play too loud! Bleed-through on stage can be brutal to front-of-house sound. Use Shure SM57s for mics and move them around the speaker to find the sweet spot and don’t overdo delays or reverbs in a big hall or ambient club - I was guilty of this in the 80s… like I was of many other things, too [laughs], sorry! Always make sure you can hear the groove and the singer - if no singer, the lead player. Time and pitch are very important. What’s the weirdest thing you’ve witnessed on tour? “I produced four tracks on [Spinal Tap’s] second album, Break Like The Wind, and I just played on the new Derek Smalls [Harry Shearer] solo album. I love those guys: Christopher Guest, Harry and Michael McKean are really great musicians; it was hard to get them to be funny as they were so good. They were awesome in the studio and I could tell how much they love playing music. 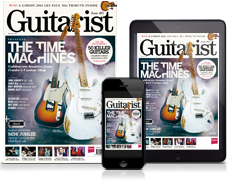 Which airline, as a musician, do you find is easiest to travel on?